James Wade was the star of the show at Cardiff’s Motorpoint Arena on Thursday, as ‘The Machine’ completed only the third whitewash in McCoy’s Premier League history, with an 8-0 victory over Simon Whitlock. Raymond van Barneveld suffered defeat at the hands of Adrian Lewis, but all three MODUS stars now occupy the play-off spots and are in strong positions to reach the semi-finals. Wade, who won the tournament in 2009, moved up to second in the table with a clinical performance, and greeted his victory with admirable humility. “I’m really pleased with how I played but it’s not nice as a professional to beat another player 8-0,” said the world number three. “I could see Simon was struggling but I had to get the job done. “It’s not nice to beat anyone by that score and I really hope it never happens again. 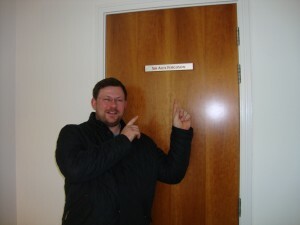 Simon is one of my best friends in darts. Whitlock now occupies fourth spot, while van Barneveld is third after losing out to Lewis. 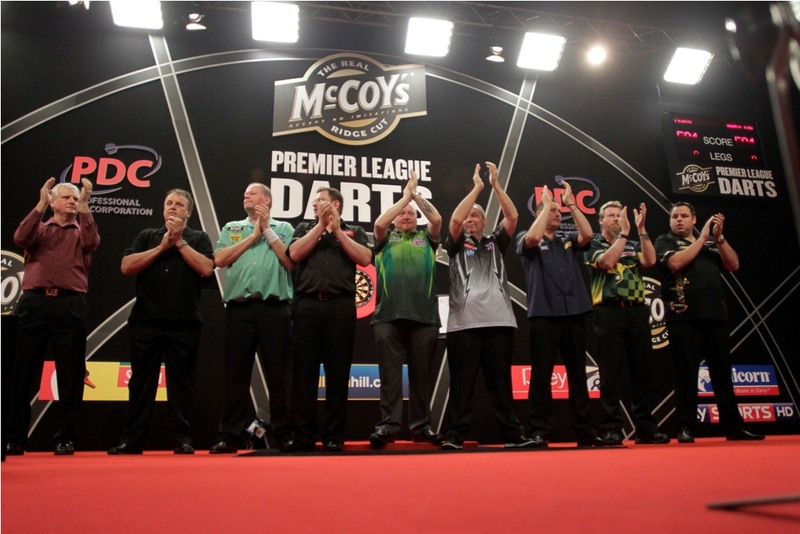 ‘The Wizard’, ‘Barney’ and ‘The Machine’ are all tied on eight points after eight nights of action. Lewis, who was playing twice in the absence of Gary Anderson, had lost to Andy Hamilton in the night’s opening match. Runaway leader Phil Taylor extended his unbeaten run with victory over Kevin Painter. The evening had begun with a moving tribute to the late Jocky Wilson, as the players joined the Cardiff crowd in a minute’s applause for the two-time world champion, who passed away last week. The darting elite head to Nottingham next Thursday, where Wade takes on Lewis, Whitlock faces Anderson and van Barneveld is up against Painter. 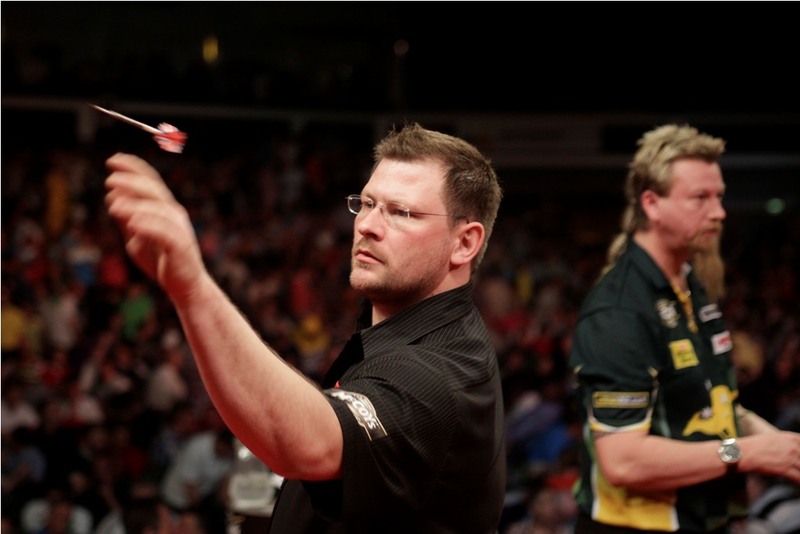 MODUS stars James Wade and Simon Whitlock go head to head in the McCoy’s Premier League on Thursday at Cardiff’s Motorpoint Arena, where Raymond van Barneveld takes on Adrian Lewis. Whitlock, who is third in the table, heads to the Welsh capital on course for a playoff place. ‘The Wizard’, who is sat on eight points at the season’s half way stage, is happy with his form in the competition. He said: “Eight points is a great total for the first half; I think you’re going to need 14 to get through to the playoffs. It’s been 14 I think every year I’ve played in it so I’m slightly in front at the minute. “My scoring’s there; I’ve got to hit some more doubles. Consistency is the key, to be consistent on hitting your scores and then hitting your doubles. A victory for ‘The Machine’ would put him on level points with his opponent. Van Barneveld is second in the table, ahead of Whitlock on legs difference. The Dutchman enjoyed his best performance so far in Dublin last week, when he averaged over 107 in his victory over Gary Anderson. ‘Barney’ faces world champion Adrian Lewis in front of another sell-out crowd in Cardiff, and says he his loving every minute of life in the McCoy’s Premier League. “When I got the Wildcard I was over the moon, and I said that I want to prove a few people wrong who said that I was finished,” said van Barneveld, who has reached the playoffs five times. The match against ‘Barney’ will be Lewis’ second of the night; he also takes on Andy Hamilton in the opener, due to Anderson attending his father’s funeral in Scotland. League leader Phil Taylor is up against Kevin Painter in the other match of the evening. The action will be preceded by a minute’s applause in memory of the late Jocky Wilson, who passed away on Saturday night. He is the second most successful player in PDC history and still just 28 years old. The future is set to be bright for James Wade, who is taking steps away from the oche to ensure that he continues to achieve more on it. ‘The Machine’, who has won seven televised titles, is sure he will add to his impressive collection of major trophies, but is not putting himself under any unnecessary pressure to do so, as he knows that he has time on his side. “This is the laid back year for me,” said the world number three. “I am not setting myself any targets at all this year. I’ve got a few other things on my mind, which isn’t an excuse, but I’m not expecting too much. I know that I have got a lot, in terms of ability though, so who knows what might or might not happen. “Having things sorted at home is massively important for me. At the moment I’m concentrating on doing that. I’ve started off a little car mechanics venture with my father, which is something I enjoy, and I’m having some building work done at home. Wade lost his first three matches of the 2012 McCoy’s Premier League season, prompting him to be written off in some quarters, but he bounced back with three consecutive victories to put himself into strong contention for a playoff place. Despite suffering defeat at the hands of Phil Taylor last Thursday, Wade, who won the competition in 2009, is in no doubt that has the ability to go all the way once again. He said: “I know I can win it, it’s whether I will or not that I’m not sure about it. I made it tough for myself again and that’s my own fault, but I’m back in the running now and it’s going to be a case of which James turns up every week. ‘The Machine’ doesn’t believe that his early season form was caused by a hangover from his World Championship semi-final defeat at the hands of Adrian Lewis, who battled back from four sets down to win amid bizarre circumstances at the Alexandra Palace. Wade remains confident that he will be crowned world champion at some stage in his career and insists that he is more than happy with his achievements so far. “To be honest I don’t think that my form in the World Championship was that great,” said Wade, whose last four showdown was blighted by a draught on stage and late finish. “I have to look back and laugh at the fact that I lost to Adrian in that semi-final. It is annoying that I haven’t been a world champion yet. It’s bugging me but I will win the tournament. It’s a case of when rather than if. Despite that confident statement, the Premier League star admitted that self belief is something that he has found more and more difficult to have as his career has progressed. He said: “My two happiest times, in terms of my career, were winning my first two major titles in 2007. I realised that I was good enough to be a successful professional player when I won the World Matchplay. “Then when I went into the World Grand Prix, which became my second TV title, I knew I was going to win it before the tournament had even started. That was a really nice feeling. Unfortunately I have struggled to replicate that kind of confidence since then. Where Wade wants to be is undoubtedly at the very top of Europe’s fastest growing sport, a sport which he feels should get the press coverage that its audience demands. He added: “I’m sure people would happy to see some other sports have a little bit less coverage in newspapers to give darts half a page a week. Unfortunately, the people who make those decisions seem to be scared to try something new for whatever reason. “It may be that they have an old fashioned attitude towards darts, but that fact that it is SKY’s most second watched sport is a little bit of an indication that there is a market for it in the written press too. ‘The Machine’ is back in action on Thursday night when he takes on Simon Whitlock in the McCoy’s Premier League in Cardiff. Raymond van Barneveld produced a fantastic performance to beat Gary Anderson in front of a PDC record crowd of 9,000 at Dublin’s O2 in the McCoy’s Premier League. The five-time world champion moved up to second in the table on level points with Simon Whitlock, after the Australian drew with Andy Hamilton. 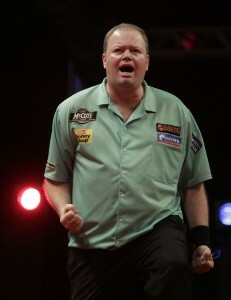 ‘Barney’ sent the Irish crowd into raptures as he beat the defending championing in a breathtaking affair. The five-time World Champion, who averaged over 107, was delighted with his performance. Whitlock earned a hard fought draw against Hamilton earlier in the evening, delighting the Irish crowd with a fabulous 152 checkout in the process. James Wade was beaten by runaway league leader Phil Taylor, while Adrian Lewis beat Kevin Painter in the night’s other match. 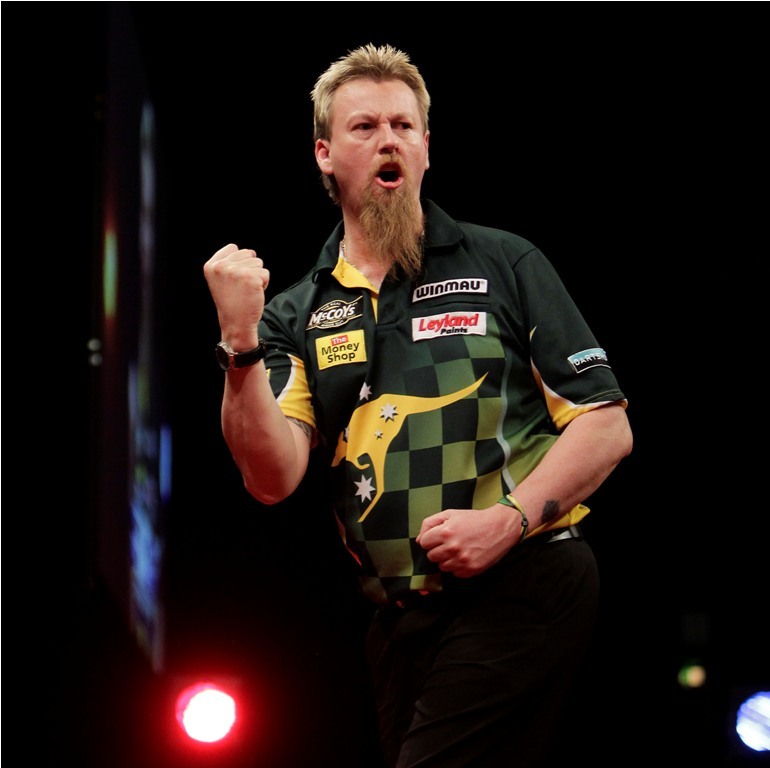 Wade and Whitlock face each other next week in Cardiff, where van Barneveld takes on Lewis. Raymond van Barneveld produced a stunning performance to beat defending McCoy’s Premier League champion Gary Anderson in a thrilling match at the O2 in Dublin. The popular Dutchman hit five 180’s and recorded a brilliant 107.22 average to see off ‘The Flying Scotsman’, much to the delight of the record breaking Irish crowd. The tremendous turnout of 9,000 was the highest ever in a PDC event and van Barneveld was delighted to have put on a show, and, more importantly, get the victory. The signs of a special performance were evident from the start, as the five-time world champion took out a tidy 109 finish to hold his throw in the opening leg. The Dutchman hit his first 180 in leg two but was unable to stop Anderson drawing level. 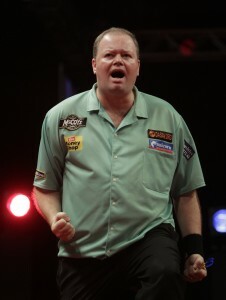 Van Barneveld hit double top to go back in front before Anderson hit double ten to hold his throw once more. ‘Barney’ won the fifth leg, hitting his second maximum in the process, before grabbing the first break of throw in the match, to take a 4-2 lead into the break. He made it three legs in a row with a brilliant 120 checkout, before Anderson pulled a leg back despite another 180 from van Barneveld. The Scotsman won the next leg, against the throw, to put himself back on course for at least a draw, but ‘Barney’ wrestled back control by hitting back to back 180’s in an awesome eleven dart leg. The pendulum swung back Anderson’s way, when he broke the throw to reduce Barney’s lead to 6-5, but the Dutchman restored his advantage immediately to ensure he would come away from the Emerald Isle with a draw at worst. He sealed the win in the next leg, hitting double sixteen to move up to second in the table. Simon Whitlock fought back to claim a point against Andy Hamilton in the McCoy’s Premier League at Dublin’s O2, hitting a roof-raising 152 checkout in the process. ‘The Wizard’ looked like he would suffer defeat against the player who knocked him out of the World Championship, but won some vital legs under pressure and was pleased to seal the draw. Hamilton held his throw in the opening leg before ‘The Wizard’ hit double eight to level up. The Australian just missed a dart at the bullseye for 126 checkout, allowing Hamilton to edge back in front. Whitlock restored parity once more by taking out 90, with two 25’s and double top. ‘The Hammer’ held his throw again before Whitlock turned on the style, taking out a sensational 152 finish when it had looked like his opponent was about to grab the first break of throw. The world number five hit his first 180 in the seventh leg, but it wasn’t enough to buck the trend of legs won with the throw, as Hamilton took a 4-3 lead. It was Hamilton who broke that run when he hit double 16 to open up a two leg lead. ‘The Wizard’ found the perfect response, hitting his second maximum en route to a break of throw, and then hitting double top to draw level at five legs apiece. ‘The Hammer’ went back in front by winning the next leg with the throw. Whitlock replied with another 180 before taking out another brilliant 90 checkout, this time on the bull. ‘The Wizard’ missed a dart for a crucial break of throw in the thirteenth leg, going wide of the double 16 bed for a 102 checkout. Hamilton hit double top to take a 7-6 lead, meaning Whitlock would need to hold his throw to draw the match. The Australian did exactly that, going out in thirteen darts to take a share of the spoils. James Wade is aiming to end Phil Taylor’s unbeaten record in the 2012 McCoy’s Premier League, in front of a sell-out 9,000 crowd at the O2 in Dublin. ‘The Machine’ takes on ‘The Power’ on the tournament’s first visit to the Emerald Isle, where Simon Whitlock and Raymond van Barneveld are also in action, as the season reaches its halfway stage. Wade goes into his clash with the league leader in good form, having won his last three matches, but knows he will need to be at his best to beat a rejuvenated Taylor. “It’s coming good and I’m getting some rub of the green, but with that performances come, and hopefully the good darts will follow,” said Wade. “I don’t think I’ve ever played a bad game against Phil but he does it week-in, week-out. I’m certainly not bothered about playing him, that’s for sure. Wade and Taylor will be on stage last, after Raymond van Barneveld has done battle with defending champion Gary Anderson. ‘Barney’ enhanced his playoff chances with victory over Kevin Painter last week and he is determined to pick up another positive result in Dublin. Simon Whitlock, who beat Anderson in Glasgow last week, faces Andy Hamilton in the opening match of the evening. 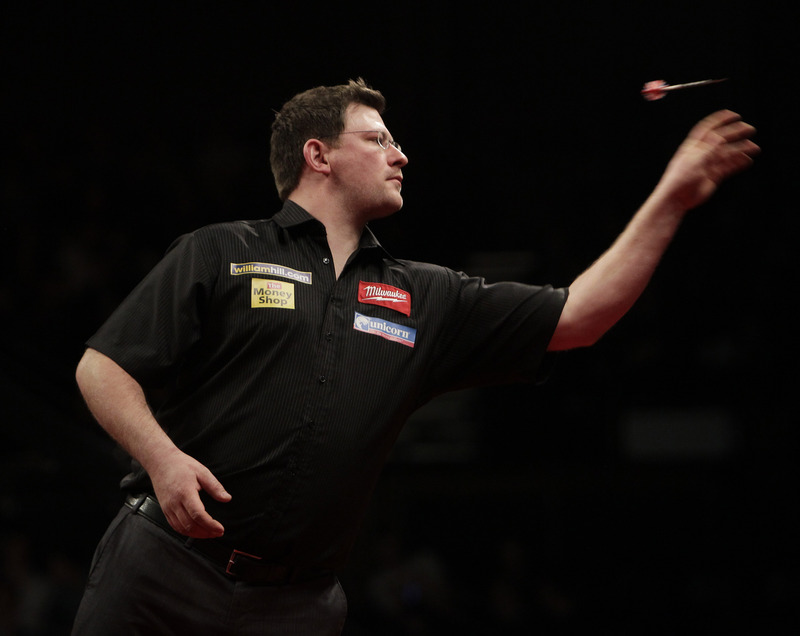 ‘The Wizard’ hopes to exact revenge on ‘The Hammer’ for his semi-final defeat at the Ladbrokes World Championship. World champion Adrian Lewis takes on Painter in the night’s other match. 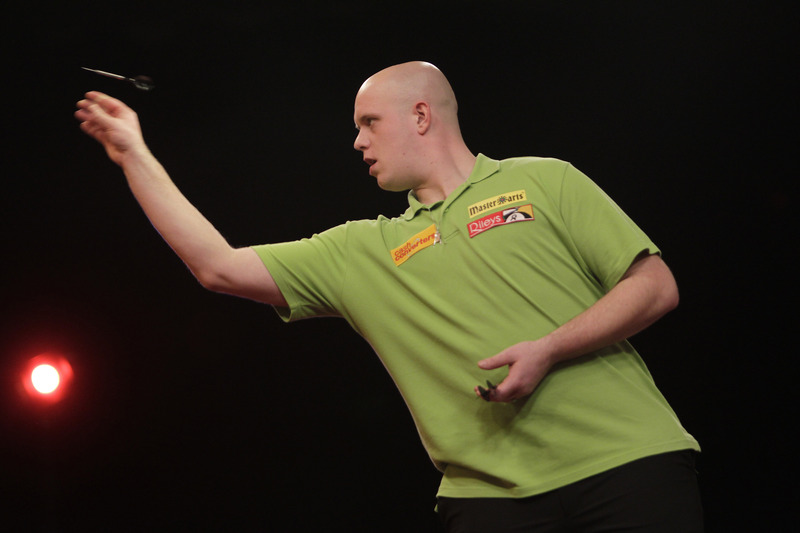 Michael van Gerwen is arguably the most promising young talent in darts. The Dutchman, who capped off 2011 by being named as PDC Young Player of the year, is aiming to make this year his most successful yet. The 22 year-old has started 2012 in typically explosive style. He won a UK Open qualifier in Crawley in February, hitting a nine-dart finish and a 170 checkout in the final. ‘Mighty Mike’ has continued to play fantastic darts in the floor tournaments so far, and he hopes that his impressive start to the year is a sign of things to come. Van Gerwen exploded onto the circuit in 2006, when he won the World Masters, aged just 17, becoming the youngest player ever to win a major title. The Dutchman has shown flashes of his electrifying ability at times, notably a nine-darter against Raymond van Barneveld at the 2007 Masters of Darts, but is starting to enjoy more consistency in his game after a year of mixed fortunes. “Last year was very strange for me,” said van Gerwen. “In the first half of the year I didn’t get any good results. I failed to qualify for the World Matchplay and the World Grand Prix, which was very disappointing for me. I am a winner, but if you don’t qualify, you can’t win. For me to show what I can do I need to qualify for the televised tournaments. ‘Mighty Mike’ is set to compete on the biggest stage of his career, when he takes on James Hubbard in the final of the World Youth Championship at the O2 Arena in May. The match will be played in front of a humungous crowd on the night of the McCoy’s Premier League Final and van Gerwen is desperate to win the competition, after losing out to Arron Monk in last year’s final. He said: “I’m looking forward to the final, especially to playing in front of such a big crowd. I’ve never been to a venue in the Premier League since I joined the PDC, so it’s even more exciting that the first time I do, I’ll have the chance to win a title. James (Hubbard) is a nice lad and I’m looking forward to playing him but I want to beat him on the night. 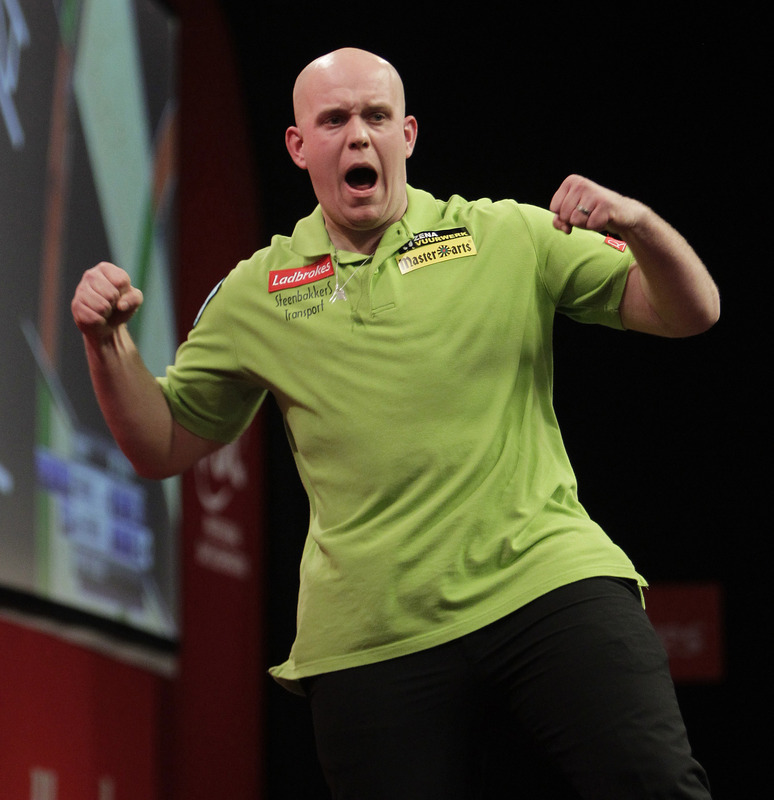 Van Gerwen hopes that victory in the youth final can act as a catalyst to bigger and better achievements this year, and the ambitious youngster is taking a wise and measured approach. James Wade and Raymond van Barneveld moved firmly into contention for the McCoy’s Premier league play-off places, while Simon Whitlock climbed to second in the table, as all three MODUS stars triumphed in Glasgow. Wade exacted revenge on Adrian Lewis, for defeat in the semi-finals of the World Championship, with an impressive 8-5 victory over ‘Jackpot’. The 2009 Premier League champion has turned his form around in this year’s competition, by following three consecutive defeats with the same amount of successive wins. ‘The Machine’ joins three other players on six points in the table ahead of next week’s trip to Dublin, which marks the halfway stage of the tournament. Van Barneveld is also on six points after claiming a hard fought victory over Kevin Painter. The popular Dutchman won five of the last six legs to grab his second win of the season, leaving the boisterous Scottish crowd delighted. 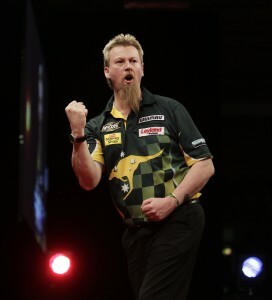 Simon Whitlock silenced the patriotic Glasgow crowd earlier in the evening, with an 8-6 success over ‘Flying Scotsman’, Gary Anderson. ‘The Wizard’, who hit a stunning 164 checkout in the match, moved above the defending champion with his third win of the season. Phil Taylor continued his unbeaten start to the season with an 8-3 triumph over Andy Hamilton in the other match of the night. Wade will attempt to become the first player to beat ‘The Power’ this season when he takes on Taylor in Dublin next Thursday. Van Barneveld is up against Anderson in Ireland, where Whitlock faces Hamilton. 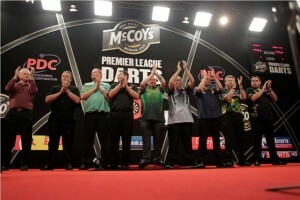 Raymond van Barneveld claimed victory over Kevin Painter on night six of the McCoy’s Premier League in Glasgow. ‘Barney’ averaged over 103 on his way to victory, in a match where more legs were won against the throw than with it. Painter grabbed a break of throw in the opening leg. ‘Barney’ responded with a maximum before hitting double top to draw level. The Dutchman just missed double sixteen for a 146 finish in leg three, but hit it in his next visit to put himself ahead. ‘The Artist’ hit back by taking out a stunning 157 finish to hold before breaking van Barneveld’s throw to take a 3-2 lead. ‘Barney’ broke back immediately once more to go into the break on level terms. The second half of the match started in similar fashion to the first, as Painter claimed another break of throw before ‘Barney’ did the same, hitting another maximum in the process. The five-time world champion hit his third 180 in the ninth leg, which he won by hitting double 18. ‘Barney’ then closed in on victory when he hit double eight for another break of throw. The pendulum briefly swung back Painter’s way when he hit double fifteen to break van Barneveld’s throw, but ‘Barney’ broke straight back once again to leave himself throwing for the match. He completed the job by hitting double 16, much to the delight of the Glaswegian ‘Barney Army’.